Today at the International Association for Food Protection Annual Meeting, Clear Labs unveiled Clear Safety, the first end-to-end NGS-based food safety platform for high-volume routine pathogen testing. Clear Safety outperforms PCR, culturing, and antigen-based tests on measures of cost, turnaround time, and accuracy. Today at the International Association for Food Protection Annual Meeting, Clear Labs unveiled Clear Safety, the first end-to-end NGS-based food safety platform for high-volume routine pathogen testing. Clear Safety decreases the chance of recalls by reducing false negative and false positive rates by two orders of magnitude compared to any other platform on the market. Clear Safety combines state-of-the-art NGS sequencing, advanced microbiology, robotic automation, data science, and software analytics to significantly lower costs while achieving 99.9% accuracy. The new platform collects hundreds of millions of data points per analysis that can be used to learn everything about a pathogen in a single test. In a pilot launched in May, Clear Labs validated with leading food brands that Clear Safety outperforms PCR, culturing, and antigen-based tests on measures of cost, turnaround time, and accuracy. The first release of the platform will support high-volume Salmonella testing. Listeria and E.coli testing will be rolled out in 2019. AOAC certification is expected in Q4 of this year. Molecular Profiling – Clear Safety enables deep molecular characterization of pathogens based on the information you need for your safety program. From species to serotypes to whole genome sequences, food safety professionals get all the visibility they need in a single test. Multi-Target Analysis – Increase throughput and reduce costs by screening an array of pathogens in the same or different matrices in parallel. Automation – Robotic pipetting and sample barcoding guarantee reproducibility and reduce hands-on labor and error potential. Post enrichment, the process is fully automated. Superior Accuracy – Clear Safety’s >99.9% accuracy sharply reduces false negatives and positives. Fast Turnaround Time – All tests go from sample to answer in under 24 hours. Advanced Software Analytics – Clear Safety’s machine learning can predict risk, assess shelf life and spoilage, and map strains to production facility sites via advanced environmental mapping. The Clear Safety platform is comprised of the most advanced NGS technology, robust bioinformatics, and the world’s largest molecular database. In addition to Clear Safety, Clear Labs has tests on the market for authenticity, GMO, and microbiome testing. 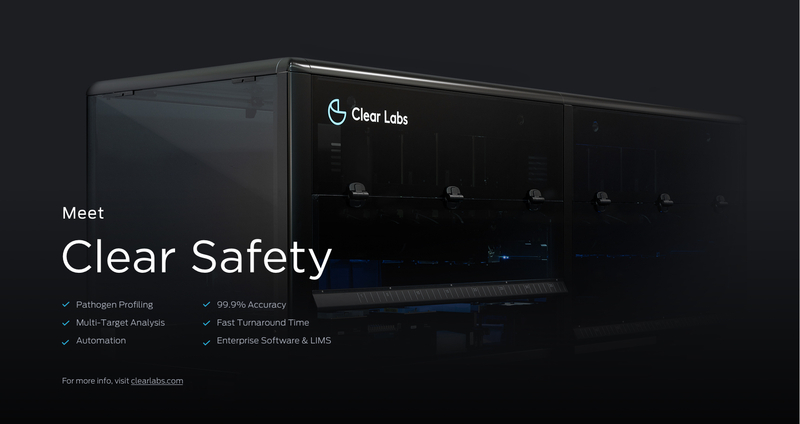 To learn more about Clear Labs or to sign-up for the commercial roll-out of Clear Safety, please visit http://www.clearlabs.com/ or find the company at IAFP in exhibition space 810. To learn more, please visit: http://www.clearlabs.com/.